Dr. Robin Kimmerer Speaks at the U.N.
Dr. Robin Kimmerer, a Distinguished Teaching Professor at ESF, addressed the United Nations General Assembly April 27, speaking for 20 minutes as part of the U.N.'s commemoration of International Mother Earth Day. 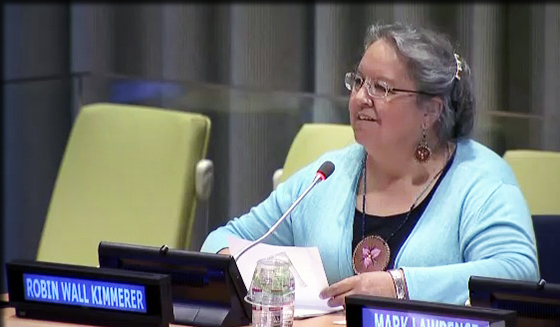 Kimmerer, a botanist and ecologist, was one of three people invited to address the General Assembly as part of an interactive dialogue called "Harmony with Nature: Towards achieving sustainable development goals including addressing climate change in the post-2015 development agenda." She was joined on the panel by Dr. Mark Lawrence, scientific director at the Institute for Advanced Sustainability Studies in Potsdam, Germany, and Maude Barlow, national chairperson of the Council of Canadians, Ottawa, Ontario. Kimmerer spoke about the importance of a shift from the anthropocentric worldview to a biocentric worldview in support of global sustainability, informed in part by indigenous wisdom. An enrolled member of the Citizen Potawatomi Nation, Kimmerer told the assembly that more than 100 years ago, her grandfather was taken from his home and forced to attend a government-run boarding school that replaced his Native view of the world with that of western settlers. She said it could be seen as a "miracle" that his granddaughter was invited to speak at the U.N.
"This very fact is a source of great hope because it shows the world can change," she said. Kimmerer spoke of the Native view that all species - including fish, birds and all plants - deserve respect and thanks for the gifts they give humans. She said humans' relationship with the land is broken and that correcting the problem requires a transformation of our worldview. The path to sustainability, she said, lies at the intersection of science and culture: "Can we collectively imagine a new kind of science?" She described the view of indigenous people: humans and the earth are linked in a reciprocity that produces equilibrium. In a biocentric worldview, she said, scientifically sound actions are in line with morally responsible behavior. Kimmerer described the Native principle of the Honorable Harvest (including tenets such as taking no more than you need from the earth and using all that you take) as "a practice both ancient and urgent" that should apply to every exchange between humans and the earth. "The easiest way to have what you need is not to waste what you have." "Do we want to be the species that threw it all away?" "Can we turn our attention away from the covenant of unlimited growth and return to the covenant of reciprocity?" "The indigenous principles and practices of the Honorable Harvest remind us of how we might walk gently on the earth while still satisfying human needs...It is a practice both ancient and urgent." "As we give thanks for the earth, will we live in such a way that the earth will be thankful for us? ...We humans are more than consumers, we have gifts of our own to give to the earth."